The Wandering Palate caught up with the Prop in Queenstown and enjoyed a sneak preview of the first Two Paddocks ‘Proprietors Reserve’ individual vineyard Fusilier Pinot Noir 2014, from the newly acquired Felton Road, Bannockburn vineyard… and as the festive season fog in the brain dissipates, the Fusilier 2014 is ingrained in my olfactories and I can still smell the lingering dark Indian spices and peppercorns on a hot wok…and that wonderful layered depth of black berry fruits and Christmas Cherry…and that alluring smokiness a melange of fire-hot schist rocks and gun flint (the smoking hot barrel of the Fusilier’s rifle no doubt)…and Oh that lush and dangerously plush texture, the wine seemingly beckoning to be drunk at a sprint even though we know it’s a long distance runner. And whilst we had a suspicion this Bannockburn pinot fruit would bring the house down, it seems to me the Fusilier is already taking a commanding position on the parade ground, a stiff arm salute and cold steel bayonet-fixed acidity to a sword drawn Major no less that will be a Brigadier given the passage of time. You too can have a sneak preview of The Fusilier 2014 if you forward march to Central Otago and the Two Paddock’s Pop-Up cellar door on Felton Road, Bannockburn… an utterly brilliant idea and the distinguished service medal goes to Jacqui Murphy, the dynamo GM at Two Paddocks who will be front and centre at the TPCD. See message and full orders from the Prop below. Opening hours are 11-4pm daily from the 5th to the 17th of January. The Proprietor, Sam Neill, is delighted to announce that Two Paddocks vineyard has been granted both resource consent and a special license to operate a Pop-Up Cellar Door at the end of Felton Road, Bannockburn, for a two week trial period in January 2016. 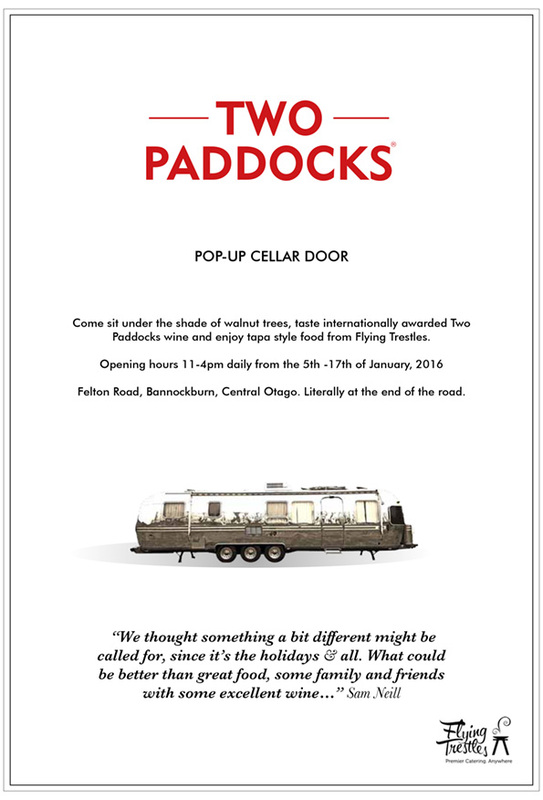 The Two Paddocks Pop-Up Cellar Door will be run from out of a beautifully restored 1982 silver Airstream caravan that has been parked alongside a grove of walnut trees in a small field at the very end of the tarmac on Felton Rd. Our neighbours, Duncan Forsyth and Louise Coutts, have kindly lent this little walnut paddock to Two Paddocks as it borders directly on to the Two Paddocks’ owned ‘The Fusilier’ Vineyard. Two Paddocks have teamed up with local catering icons, Flying Trestles, to provide an eclectic selection of tapa style food that will be good to share and enjoyed alfresco under the shade of the trees with a chilled glass of crisp Riesling or a brooding, textural and savoury edged Two Paddocks Pinot Noir. All of Two Paddocks Pinot Noirs and Rieslings will available from the Pop-Up including the multi London International Wine Show Trophy winning The Last Chance Pinot Noir from their most southerly Alexandra vineyard and some rare older museum release pinots. Follow Two Paddocks on Facebook, Instagram and Twitter @TwoPaddocks & @TwoPaddocks_Cru for Pop-Up updates. Established in 1993 by Sam Neill, initially the sole aim of Two Paddocks was to share ethereal Pinot Noir moments with loved ones. Although production is still small, we believe Sam is the only vigneron to own vineyards in three main valleys of Central Otago – Gibbston, Cromwell (Bannockburn) and Alexandra with talented teams led by Viticulturist Mike Wing and Winemaker Dean Shaw, delivering his vision. Sam is an addictive blogger – check out the www.twopaddocks.com website for his humorous insights into all things bright and beautiful that reside at Two Paddocks.